Born and educated in Poland, Professor Dorota Iwaniec read Psychology at the University of Krakow, and later obtained her qualification in teaching. She came to England in the early 1960s, and studied at the School of Social Work, University of Leicester, where she gained her qualifications in Social Work. Later, she read for her Doctorate at the same University, obtaining her PhD in 1983. She has had a very interesting career, working as a biology teacher, a social worker, a researcher, and a therapist in Leicester. She directed the Practice Teaching Resource Centre in Residential and Day Care Services for the Social Services Department in Leicester, and worked at the Child Treatment Research Unit at the University. She conducted numerous research projects in the areas of Child Protection, Emotional and Behavioural Problems of Children and Adolescents, and the Parenting of Children. She has acquired an international reputation through her research and her many publications in the areas of emotional abuse and neglect and children who fail to thrive. In 1992, Dr Iwaniec was appointed to the Chair of Social Work at The Queen’s University of Belfast. 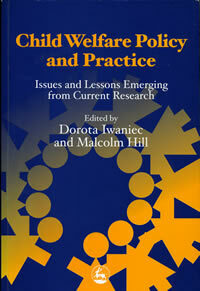 In 1995 she became Director of the Centre for Child Care Research which she created. She has written highly acclaimed books, contributed many Chapters to various edited books in her subject-area, and published over 100 scientific papers. She has given many keynote addresses at international conferences in different parts of the world. She was instrumental in launching the Journal of Child Care in Practice in 1994 of which she was Editor-in-Chief for many years. She continues to be Patron of the journal. She has done extensive public work with voluntary and statutory organisations in Northern Ireland and in England (details are provided below), and in particular she has done long standing work for HomeStart (a voluntary organisation helping parents to provide a good early start for their children) since her time in Leicester. She passionately cares about children and has spent all her adult years in professional and public capacity working for better understanding of children and helping their families in an informed way. She has been a Patron of the Family Care Society (NI) from 1998 to the present. Her achievements were recognised by her election to the Academy of Social Sciences and Award of Woman of Science in 2005 by Save the Children Fund and was elected a member of the Royal Irish Academy in 2007. She was appointed as Deputy Lieutenant for the Borough of Belfast in 2007. She retired from her academic posts in September 2005 but is still involved as an expert witness for child care and protection cases in Court, running workshops and courses in the areas of her expertise, and continues to write. Expert witness in Courts (Attachment, Parenting, Emotional Abuse and Neglect, Failure to Thrive and other child protection issues). Running training courses and workshops on: Emotional Abuse and Neglect, Failure to Thrive, Child Development and Attachment Disorders, and Assessment of Children in Need. Awarded Save the Children NI Women of Achievement Science Award (2005).